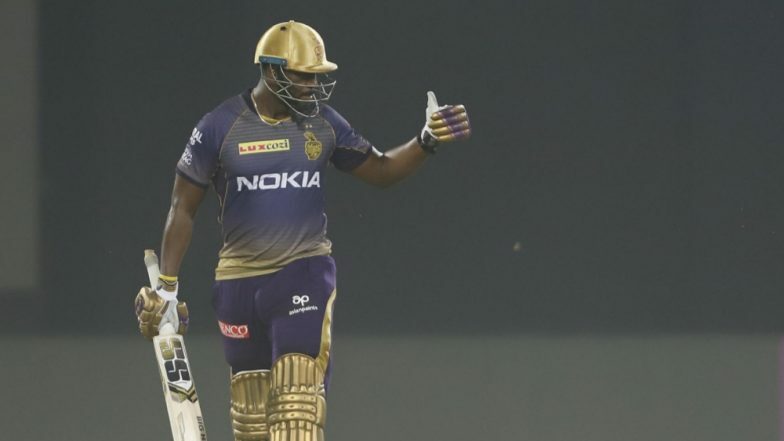 Andre Russell once again came to Kolkata Knight Riders’ (KKR) rescue as he scored unbeaten 48 off just 13 balls to help his side chase down 206 runs against Royal Challengers Bangalore (RCB) at the M Chinnaswamy Stadium in Bengaluru. KKR chased 206 runs with five balls to spare and lost five wickets. The win was Knight Riders third in four matches while for RCB it was fifth consecutive defeat in IPL 2019 as they continue to be winless. Andre Russell's 13-Ball 48 Powers KKR to Victory, Hands 5th Defeat to RCB in IPL 2019, Twitter Goes Berserk with Memes. At one stage with required run-rate for Knight Riders over 14 runs per over it appeared that RCB will register their first win of the season. However, Russell made all the difference as he toyed with RCB bowling attack. Enroute to his match-winning knock, Russell smashed Tim Southee for fours sixes and a four in the penultimate over, leaving KKR just one to win from last over. Funny RCB Memes Go Viral As Andre Russell Onslaught Shocks Virat Kohli & Co. in IPL 2019 Match 17. Apart from Russell, Chris Lynn, Robin Uthappa, and Nitish Rana chapped in with 43, 33 and 37 respectively. After losing Sunil Narine early, Lynn and Uthappa added 65 runs for the second wicket. KKR then lost both the batsmen in quick succession as RCB made a comeback. It was Russell who provided Knight Riders the winning touch and made sure they move to second place on the IPL 2019 points table. RCB vs KKR Highlights IPL 2019: Andre Russell Hands Royal Challengers Bangalore 5th Consecutive Defeat. # This is KKR's highest successful chase in IPL. # Virat Kohli becomes the second Indian batsman after Suresh Raina to complete 8,000 T20 runs. # Ninth time Virat Kohli and AB de Villiers have 50 plus scores for RCB in same innings. Earlier, Virat Kohli and AB de Villiers scored 84 and 63 respectively to take Royal Challengers to 205 for three. Put to bat first, Parthiv Patel and Kohli added 64 runs for the first wicket and then RCB skipper and De Villiers took over to added 108 runs for the second wicket. Meanwhile, RCB continue to languish at the bottom of the IPL 2019 points table.